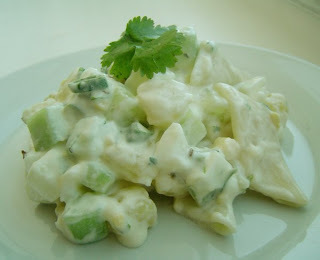 Peal and dice the potatoes and the cucumber into ¼” cubes. Boil the pasta and the potato with about 2 tsp of salt. Drain the water and leave it aside. Boil the egg separately and dice it into ¼” cubes as well. Finely chop the coriander leaves and the green chillie and grate the cheese. In a bowl take the potatoes, pasta, eggs, and cucumber. Add all the other ingredients. Mix well. Check the seasoning and if required add a little salt (about ½ tsp). Can be served as it is or if preferred, may serve it chilled as well. *I prefer to use home made mayonnaise. If not, use a plain mayonnaise from the grocery store. **You may also use any other herb of your choice, or do away with it also.